Tobacco, the main ingredient in cigarettes, cigars, pipe smoking, chewing tobacco and smokeless tobacco products can cause severe problems to your health, including the health of your mouth. Dental damage Tobacco products cause a mouthful of problems. Cigarettes, as well as smokeless tobacco and marijuana, cause dry mouth and reduce your gums’ ability to heal from infection and inflammation — making it easier for gum disease to develop. 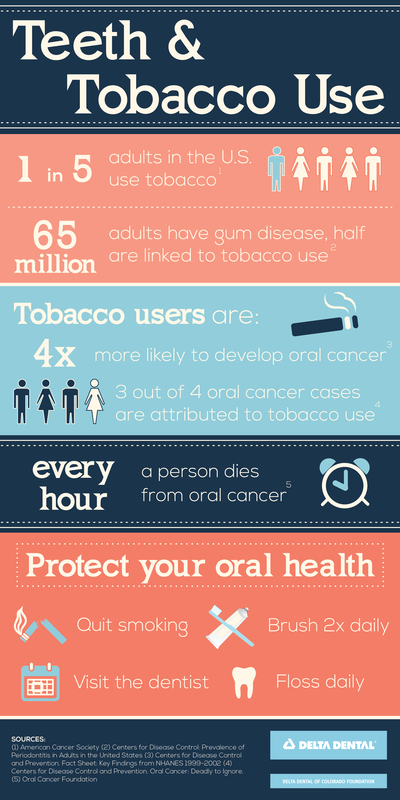 Tobacco products also increase the risk for oral cancers, and chewing tobacco especially has been known to cause cancers leading to the loss of teeth, tongue tissue and the entire lower jaw. Not to mention, it causes unsightly yellow tooth stains and receding gums. Whole health harm Most people know smoking can lead to lung cancer and a host of other aliments, but not nearly as many realize smokeless tobacco can do just as much harm. Tobacco products cause heart disease, lung, mouth, tongue and throat cancers, high blood pressure, osteoporosis, respiratory problems, discolored skin and nails, and thin or brittle hair. So do yourself a favor and toss the tobacco today! Click here to increase image. Well said. Interesting thing I found is that some people believe smokeless tobacco products are somehow “better” for one’s health. Additional community promo on the harmful effects of smokeless tobacco products would be beneficial. Absolutely. Smoke is harmful, but smokeless tobacco can also do some damage.